You may have heard the Internet of Things as an industry buzzword, but what exactly does it mean? The IoT refers to virtually connected objects that communicate with one another through technology. The 3 basic components required are sensors, internet connectivity, and processors that provide the computing power. With sensors from the physical device, information from the environment can be extracted and passed to a computer system. The data travels through a network. Then combined with AI, the computer system can make accurate forecasts and provide insight with analytics. 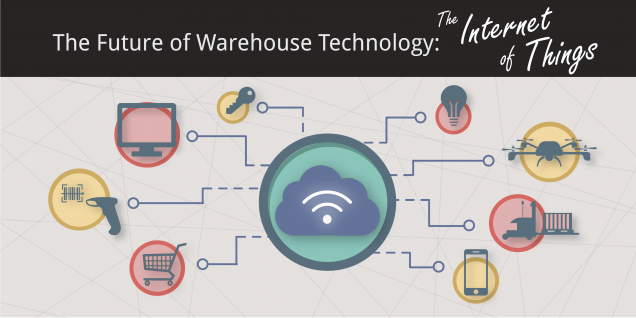 This week, we are wrapping up our 4-part series on the future of warehouse technology with the Internet of Things. The IoT is the backbone of the topics we covered in earlier weeks – robotics, drones, and image recognition technology. Without the IoT connecting the physical gear to a computer system, the Automated Guided Vehicles would be nothing more than an aimlessly running car. The drones with their image recognition technology would have no database to pull information from. In addition, inventory tasks using barcoding and radio-frequency tagging (RFID) would have no system to transmit to. According to the Gartner report, the estimated number of connected devices across all technologies for 2018 is 11.2 billion, and that number is expected to climb to 20.6 billion by 2020. That means there are currently more connected devices than the world’s total population! The Internet of Things is growing quickly, and with applications in various industries, you should be aware of its powerful influence. So how does the IoT apply to warehousing, inventory management, and the supply chain? You can track and trace the movement of your inventory. The IoT connects all the moving parts – from arrival to your warehouse to the moment your customer receives it. The IoT can help to prevent the loss and damage of products, but it also provides more information than mere location.. It can monitor expiration dates as it sits in your warehouse then alert you to take action. This reduces product waste and spoilage, and allows you to provide higher quality products to customers. Vision picking is a branch of augmented reality that allows for busy workers to work hands-free and efficiently. In fact, it can improve warehouse productivity by 15%. With smart glasses, the worker sees the order picking instructions through a visual display. The item’s current location and where it needs to be brought to is shown. Since it’s wearable technology, workers require minimal training, and you don’t need to make structural changes to your warehouse. With this method of error-free optical picking, you can automatically track lots and serial numbers while reducing paper waste. Since the IoT ties your logistics together, your system can spot trends and opportunities. With real-time visibility, you can also react quickly to market changes. With the insight provided by the IoT, you can identify the areas in your warehousing operations that aren’t doing well and make tactical decisions moving forward. Drones can perform cycle counts at night and have the data ready for human workers to review in the morning. This prevents operational down-times and reduces costs associated with having a human do the job, like labor, electricity, and time. IoT enabled robotics can also help with the picking and packing. By automating repetitive tasks, human efforts can be allocated elsewhere. You also reduce inventory damage and order inaccuracies. The IoT seamlessly passes information from your inventory to your software system. It increases efficiency, revenue opportunities, and improves overall operations. If you look at your environment, you often don’t think twice about the objects connected objects around you. Especially in supply chain and warehousing, technology is reinventing all the traditional practices. The industrial IoT is paving the way for competitive supply chains, is your business ready to adapt?